In this post I want to share a useful tip for those working with Red Hat JBos s BPM Suite 6.x (based on Drools jBPM 6.2). During development phase is normal to redeploy your project many times to view/test your changes. As you already know the JBoss BPM Suite offers a rich and powerful Workbench that supports the full BPM life circle (from design to deployment) – Business Central (Kie Workbench). In the business-central every time you try to do a build your project It also tries to deploy in the jBPM runtime. 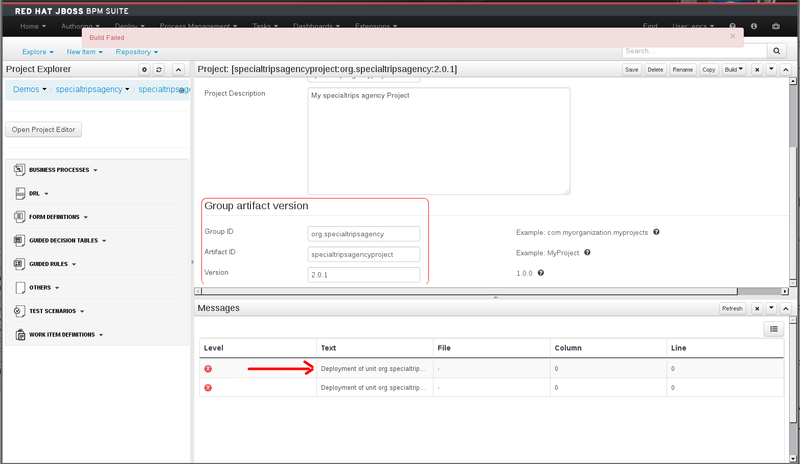 At this time the jBPM Deployment Manager checks for any existing project artifact with the same Maven GAV coordinates (Group Artifact Version). The Maven GAV coordinate uniquely identifies each project artifact deployed and managed by the BPMS. So when you try to redeploy your project without change the project version before, your Build & Deploy will fail. You can workaround this going to Process Deployments (top Menu > Deploy in the Business Central) and undeploy the Process artifact. But doing this every time you want to test a change is very boring and time consuming. To avoid this you can pass a System Property to the BPMS during the startup to instruct it to accept artifacts redeployment using the same Maven GAV coordinates. Note: This approach is documented in the official Product documentation – Administration Guide (item 2.4). I hope this little tip help your JBoss BPM Suite usage during process development.